Texwrap - Packaging Lines, Inc.
technology combines servo technology, PLC control and machine mechanics into one optimized unit. The result is a machine with minimal moving parts, minimal maintenance requirements and maximized performance. 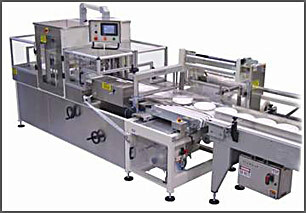 All conveyors are either servo driven or have AC inverter duty motors powered by AC vector drives. including side seals with no consumable items like rubber rings, pads, etc. If your application requires production performance, true 24/7 reliability, and flexibility, the 1809 series is the solution. Sercos fiberoptic system allows 6 additional servo axes in the 1809 controller for custom infeeds, outfeeds, etc.